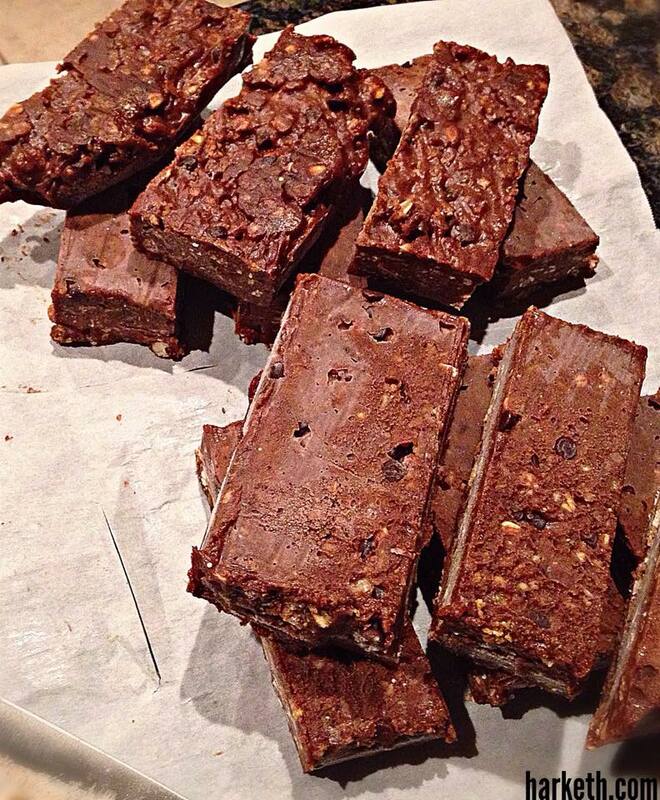 If you’re needing some extra protein in your life, a quick and healthy snack, or you just like making edible things, these protein bars are phenomenal. A heads up: the cooking style at harketh is more wild and untamed than your typical cookbook. Also, we didn’t take nearly as many pictures as we should have. To make up for that, generally interesting, unrelated pictures will be included. There's a puppy for you. Thanks for coming by. Here’s the ingredients used. You can replace most of them with similar products if you have a brand or such you like better. *Sure, this is where table spoons and teaspoons and such come in. But who has time for that archaic bull poop? Now that you have the goods, it’s recipe time. Get a decent amount of water boiling. Pit the dates if you don’t have pitted ones. Process/Blend/Mash to hell the now bit-boiled dates. Pour in a big bowl. Crush granola up with a vengeance. Pour into the big bowl with the date puree. Add the peanut butter, protein powder, coconut oil, cinnamon and honey and a quarter of the chocolate chips. Mix that mess up until its one sticky, uniform blob. If it seems too liquid, add more granola until it’s thick and solid. Stick that bowl in the freezer for 15-20 minutes, or until its cooled off enough not to melt any further chocolate. Add the rest of the chocolate chips, and mix it up. Should be reminiscent of the worst cookie dough you’ve ever seen. 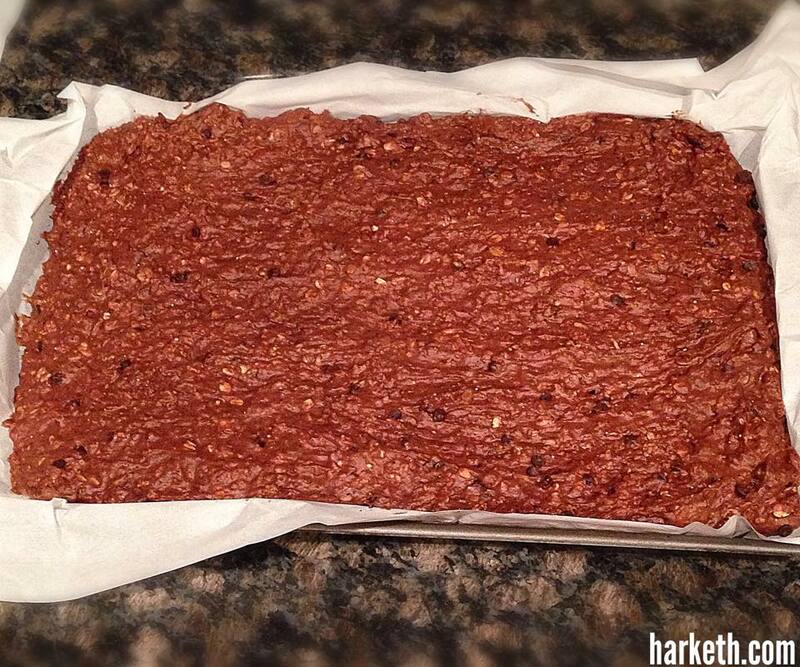 Cover a baking pan with parchment paper, pour the glob of protein goodness in and flatten it out until even. Chop that beauty into bar sized pieces. It’s not a good internet thingy without pictures. Here’s the final results, pre and post cutting. Assuming you used these materials, here’s the nutrient breakdown. Honestly, you could take out the honey and chocolate chips to cut back on the sugar (it’s a bit much) but it won’t be as good that way. Besides, it’s the protein, calories and caffeine that really matter. Number of bars: ~24 over-sized bars. Ok, so it’s not the healthiest protein bar around. But, it beats the heck out of a bowl of cereal and any candy bar you care to eat. It’ll keep you full, and help with those muscles we all hope to have one day.